Chomp Shark Chase is the sixth level of World 4 found in Yoshi's New Island. 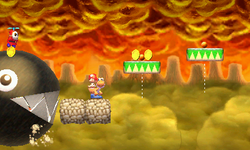 Yoshi starts the level in a desert-like area with erupting volcanoes and lots of platforms. Soon, a Chomp Shark appears and starts to chase the Yoshi at a high speed. Eventually, it hits its tooth on a platform and is defeated, leaving the Yoshi to go through the nearby Goal Ring.